do i need EE for salvation or the diablo servers? Diablo server "Viking Northeast" module name "Home Town" is a classic NwN server still on-line for years on the same IP : so I'm sure you don't need EE, because I do the screenshot from classic NwN client (I don't have EE). For the other servers people talk (Salvation and the other): I don't know. Because lot of year ago was closed the Bioware main server where the NwN module servers connect to announce his IP, on classic NwN client you need the module server IP to play it ... I think there was some patch for NwN WINDOWS VERSION to solve this problem (http://www.neverwinternights.info/nwncx.htm), but for decades I'm not Window's user anymore so I need the IP of the servers to play on my NwN non-windows client. On way you can use is search on google with the module name: "NWN Salvation"
* If you search on the forum for the "Server IP" or similar usually you found it, but on salvation module wasn't any post. - I can't found "salvation" info on the Vault (https://neverwintervault.org) or Wiki (http://nwn.wikia.com/wiki/Main_Page) ... sometimes you can found servers IP on this pages. So I search deeper on google and found something very interesting: NwN Beamdog server's list!!! Will 1.69 clients be able to connect to NWN:EE servers? No. 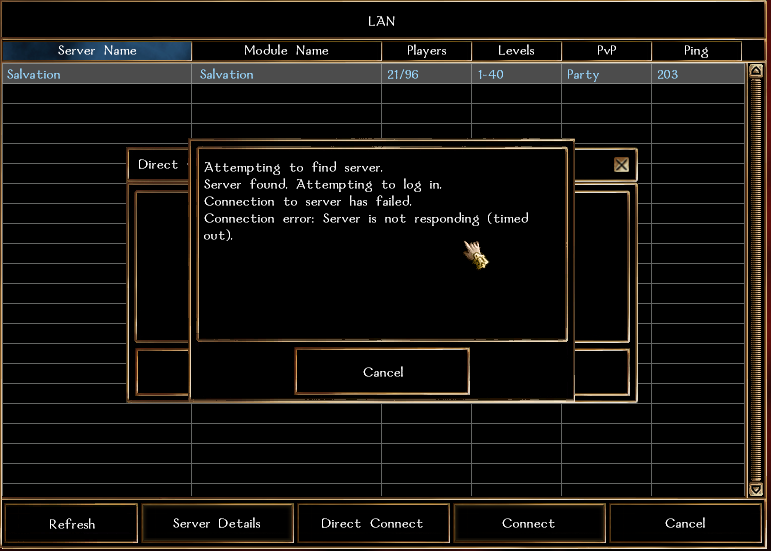 While save games and modules created in older versions of Neverwinter Nights are usable in Neverwinter Nights: Enhanced Edition, NWN 1.69 players won't be able to connect to NWN:EE servers. Like all previous patches, we change the networking model continuously to allow us to implement new features and fix bugs. You will need the same NWN:EE client version to connect to an NWN:EE server. So is there any way KT/Dx2 is coming back? I hate to be the guy that bugs people about it but been playing various nwn servers for like few weeks now and none of them stack up really. Talked a few of my friends into purchasing the EE, and they've been loving it too. If anyone manages to get the server up and running I wouldn't mind grabbing the EE for a couple people from KT on steam. Probably he isn't subscribed to this topic or stop receiving notifications if he have missed to read one message: this forum don't notify for a new message on a topic if you have received a previous notification but you didn't "read" the topic (login & check the topic) ... so probably he is not reading us. Both. I keep having internet problems on this end. I can't explain why, but my upload and download speeds would start out good after a full reset but kept dropping. I think it was because I was running two separate routers off my single account (even though my ISP says it can be done). Either way, I now have a single ISP-provided router that I'm not allowed to reconfigure (I don't even have the password for it). Everything downstream of that is DHCP which means my previous settings to allow you all to log into the NWN server are no longer good. PLUS, I have a dynamic internet net address. It's 114.179.171.24 at the moment, and I don't know when it will change again. Last time I was here, I paid extra for a static IP address. Without a master server directing traffic to the NWN game servers, every time my IP address changes, everyone is knocked off. Anyway, I believe someone offered to host KT. I'm no longer interested working on it. My wife recently passed away, and I regret spending so much time on computers that should have been spent with her. A word to the wise in that regard. Family is more important, and hours spent gaming are hours that you can never get back with your spouse and children. If someone wants to host it the right way, I'd really like to be unburdened with it. Also, in the past (2012) he allows Diane (DarkSky) to host DX2 ... so it's possible he gave KT or DX2 to someone to host one of this mods ... but I really didn't know what can be his condition or petitions "to host it the right way" ... if you have the possibility to host a NwN module 24 hours x 7 days/week then I think you can try to contact him and ask for host the mod. I just emailed Sarah about the opportunity to host the servers, i'll let you guys know if i hear anything back. Are you planning to host it? In this case, with the original NwN server or with the EE version? hosting the mod on EE server only EE clients can connect (original clients can't connect, I'm sure of this). hosting the mod on original server seems can connect to it all clients (original clients and EE clients). I would take a poll, probably. If everyone had EE then I could buy EE for myself and host it there, otherwise I could just host it on the original and let everyone connect to it. Might just be easier to do it on the original anyways. And Sarah might prefer the original. This is all speculation if Sarah responds, for one, and lets me host. Hello all. It's great to see a few still around It's been a while. I don't play anymore cause a year ago the Dr's told me I had stage 3 cancer and that I needed surgery "ASAP". After surgery I had to take chemotherapy for almost a year. I was so sick I couldn't play with the people I always enjoyed playing with and I miss that so much. It would be awesome if one of you could host DX or KT. I know it sure would pass my time and keep my mind off my problem but most of all be with old gaming friends. I miss you all. I'm so sorry to hear that Dark. As offered I was looking into hosting it, but had no way to contact sarah and ask for permission. So we thought the next best solution was to contact you. Do you have some way of getting in contact with him and asking permission? I'm sure all of us have missed you equally as much. I miss all of you guys. I hope things are going better for you now, let us know if we can do anything! Thank you. I'm taking one day at a time. I'm saving up to have my laptop fixed and then gonna try playing again. Until then God bless you all. I am very sorry to hear about your condition. My heart goes out to you and you will be in my prayer. I pray that you will be strong again soon and will come back to battle monsters side-by-side with me one day. Thank you Rom, I miss playing with you, I learned alot from you and Sarah over the years I sure do miss you all. Last Friday I went for my 3 months pet scan, today they read me the results, my cancer is under control and NO more chemotherapy. Yes, I am so Blessed and will never doubt anything ever again cause I'm well now, I have God and all the prayers from my good friends to help me through all that. I love you all so much. I am very happy to hear that, as us all knights in the KT/DX realm are I am sure. You are the guardian of the realm and the good lord knows that it needs you to keep it safe:) Stage three is a good time to catch it. My sister's cancer was caught at stage three and now she is cancer free also. God bless and live long and prosper! Thank you Rom. God Bless your family. I was missing this posts, sorry!!! I'm sad to hear about your disease Diane, but I'm also very happy to see you are fighting it and winning!!! Please Diane, be strong and take care!!! Send you a hug and God bless you all!! Thank you SevenWitches, It's a very long road and a nasty disease for anyone. But God is holding our hand through it all. It's made me a stronger person. I love you all and hope to play with you all again soon. God Bless you.